In a healthy long-term relationships, romance isn’t saved for birthdays, anniversaries. Hectic times can happen to any of us, but it’s always important to check in with your partner and let them know you’re thinking of them. It’s incredibly hard to keep the passion alive when we’re juggling raising kids and having to drive them everywhere, possibly dealing with illness and therapy appointments, financial stresses and job responsibilities. All too often romance is the last thing on our minds after a long day of running around. But when life spins out of control, there’s lots of simple little things you can do to keep romance alive when life gets crazy. Let’s start with words. Those can be either spoken or written words or even texts. Tell your spouse that you love him or her every single day. Tell them how much you appreciate what they do. It doesn’t take much time or effort, but makes a big difference in your spouse’s day. We all want to feel appreciated and hearing some thoughtful expressions of love and appreciation will do just that. If you’re on the shy side or you’re not around your partner much during the day, share your romance with written words or texts. Write a little love note and hide it in your partner’s lunch box, brief case or purse to find during the day. Send them a quick email or text to let them know you’re thinking about them. Or you could even go old school and write a love letter. No matter how you do it, use your words and keep the romance alive. Of course it isn’t just about the words. You can also show your love and appreciation in the things you do for your partner. Pay attention throughout the day and see what you can do to make his or her life easier. Go get gas in the car or ask them if they need anything while you’re out. Surprise your significant other with coffee in bed in the morning, or send them off to take a nap or a long shower while you take care of the kids. How big or small your shows of affection are really don’t matter as long as you make it a point to do something special for your loved one each day. This is all too easy to put on the back burner. Keep the fire burning by kissing your partner every morning or and give them a quick hug while you’re both fixing coffee. Again, this doesn’t have to be a big deal. Sure it’s nice if you can take 30 minutes to give your partner a long massage but on crazy busy days it’s easy for exhaustion to take over. While the days may be busy, there’s always time to work in quick hug, a kiss or holding hands when you can. And don’t forget about things as simple as snuggling on the couch while you watch TV after a long day of work and raising kids. Some days it’s a lot harder to be romantic than others, isn’t it? We all have crappy days and sometimes just don’t feel like putting in the time and effort. Do a little something anyway to nurture your marriage. Marriage takes work as does keeping the romance alive. As I mentioned earlier, that doesn’t mean you have to go all out all the time. It’s perfectly normal to get tired, have a bad day and you should let your partner know when you’re feeling that way. But when that single day turns into weeks and even months (or more) it’s time to get intentional and renew the love, passion and romance in your marriage. When things are in dire straits it isn’t easy to make the first move. It’s especially hard when you just aren’t feeling it and your spouse isn’t helping. It’s hard when you’re feeling stressed, didn’t get enough sleep and are upset with your significant other about forgetting to put the laundry in the dryer or something else they forgot. It’s going to take hard work and lots of intention to rekindle the romance in a marriage worn down by the responsibilities and worries of everyday life. Start small. You’re not going to fix everything that’s wrong in a day. Begin by making small gestures, like a kiss and a compliment. Show some affection and interest and demonstrate how much this relationship means to you. Get away from the house, and over coffee or quiet dinner have a conversation about the lack of romance and what the two of you can do together get the spark back. Slowly work your way up to more romance. The most important thing is to spend quality time together. Feed the kids dinner first and then sit down to a romantic candle light dinner just for the two of you. Better yet, go out. Find a babysitter and go out to watch a movie together. Once a year, try to get away for the weekend. Forcing yourself to be romantic when you’re not really feeling it is well worth the effort. It shows your spouse that you still care and still want to make him or her feel loved. This is by no means an exhaustive list. Think of it more as some inspiration to help you get started. Give one or two of these ideas a try, but you might want to come up with things to do that are meaningful for both of you. Just keep making that effort to do something every day to keep the romance alive. It’s that time of year when the reality of the new school year starts to sinks in, followed closely by Mommy Guilt. There’s the never ending doctor appointments and wondering if we should attempt any extracurricular activities. And when do I fit in time for my own self care? Being a mom with chronic pain is the hardest thing I’ve ever had to live with. The mommy guilt is never ending. It’s hard for me to watch the families around me who are able to participate or at least just get their kids to the plethora of supplemental activities in our area. It’s harder still to watch the happy pictures on my social media feed of happy families who simply get to do life without lots of forethought. Just like I used do to before cervical dystonia entered my life as a very unwanted houseguest in 2010. In our family we have been blessed that as a retiree with a pension, my husband has been able to take over much of the care for our son and get him where he needs to be. 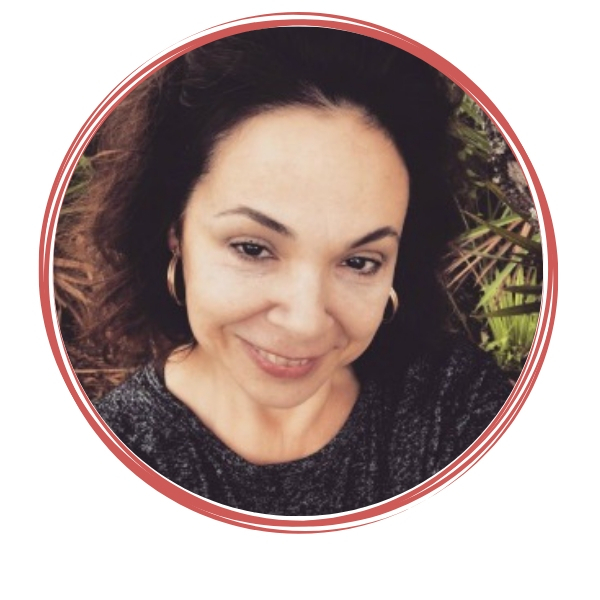 My cervical dystonia diagnosis has also meant getting off the long wait for social services in Florida to get much needed assistance, and I’m profoundly grateful for that. God has shown his provision for our family, without a doubt. The anxiety begins as I consider the school year calendar. I really need to get in the pool 2 or 3 times a week. How do I manage that at the end of the day when I’m typically exhausted and out of spoons? And what about church and small group activities…you have to show up to feel part of but how does that work when you’re constantly leveled with fatigue? How about a 12 step recovery meeting once in awhile? These days, many of my friends live in my computer now. I know that’s not the best thing but am not sure what the alternative is in this season of my life. Right now I don’t know how it’s all going to come together. It is labor intensive for the rest of my family. I’m working on better time management practices and organization. I have to plan around the reality that some days my muscles are going to be spasming so much I don’t want to get out of bed, much less leave the house. I can drive locally but get really nervous on the interstate at rush hour. Spiritual Disciplines – My journey with chronic pain has really developed my interest in prayer, meditation and the spiritual disciplines. Years ago in recovery rooms I learned that we only have a daily reprieve from our disease based on our spiritual condition. Taking that daily time with God helps the day to flow better, and I’m learning to continuously work on practicing the presence of God and developing a habit of unceasing prayer. Self care – As moms, we tend to put ourselves last. I did it for years. 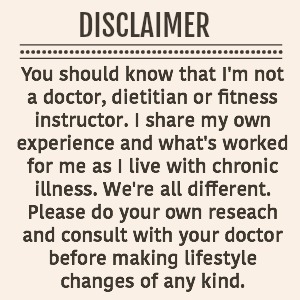 But when chronic pain or illness is a part of our lives, we have to make that time for our own wellness a priority. It isn’t selfish. Simplify your life as much as you can to minimize stress. Use your crockpot to save spoons at the end of the day. Have your kids help clean the house. If you need a pajama day, it’s perfectly okay. Take full advantage of the convenience of online shopping. Find what you love and just do it – I blog because I like it. Writing is a great release for me and I’ve loved learning all the technical ins and outs of blogging. It’s empowering to know that my brain still works. I also love yoga. When I could do little else besides lay on the couch and read, yoga gave me my physical life back and something to strive for. For you it might be quilting, crocheting or gentle gardening. Whatever it is for you, it’s a great mental distraction from the dailiness of chronic pain. Communication – Talk with your family about your condition and how it impacts you without making them feel guilty or overwhelming them. You’ll have children who are more sensitive and patient. That being said, it is hard to watch them sacrifice over and over again. 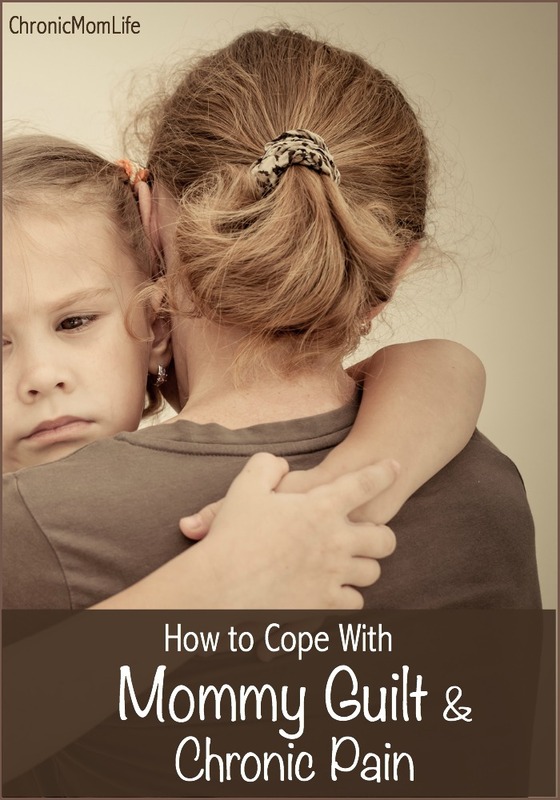 Let go of Mommy Guilt – You’re a good mom (preaching to myself here.) You are enough. Do the best you can. Embrace life’s little moments as they come to you no matter where you are. Whether you’re on the couch or out and about, your children love you no matter what and appreciate what you do for them. How do you find balance as a mom and a chronic pain patient? As the school year gets underway and family schedules become more crazy, it’s all too common to succumb to the temptation and ease of processed foods as you dash out the door. Getting your family to consume enough fruits, greens and other veggies on a daily basis can be pretty challenging, especially when you have fussy eaters. Smoothies are a great way to sneak some healthy produce into their diet but looks and tastes quite like a milk shake. What’s not to love? Begin with trying out with some simple fruit and yogurt smoothies. Don’t get too exotic right away. While green smoothies are delicious and good for everyone, your kids might be wondering what the green stuff is. Blend some banana, frozen strawberries, and a bit of vanilla yogurt for your kids. As smoothies become part of their routine, you can slowly cut back on the sugar. This is easy to do by reducing the amount of banana and adding more berries. Then you can switch the sweetened vanilla yogurt for plain or Greek yogurt. 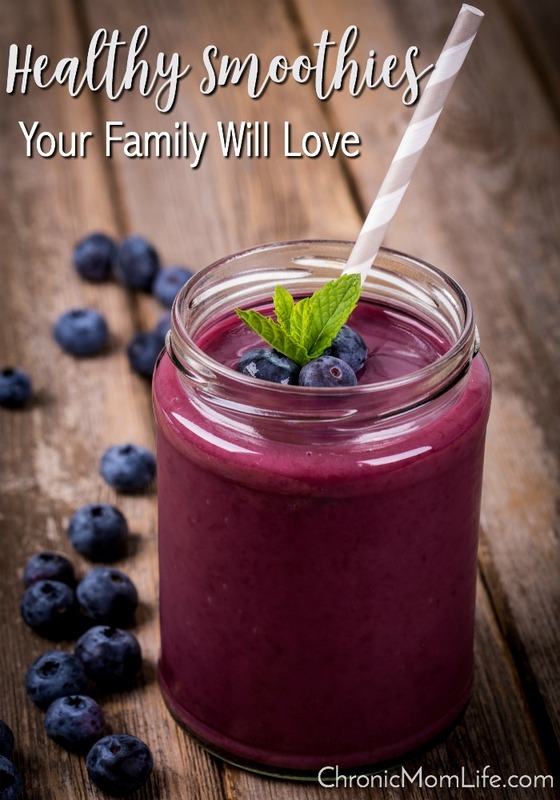 Once your family members have become smoothie fans (meaning they actually start asking for them!) you can begin to branch out and introduce them to the green stuff. Start with just a few greens and lots of fruit. If your kids are younger, give the smoothie a cool name like “Green Monster Mash” will help to increase the appeal of green smoothies. Be sure to keep the portions small. Sample a bit yourself and make sure there is no veggie taste before offering it to your kids. 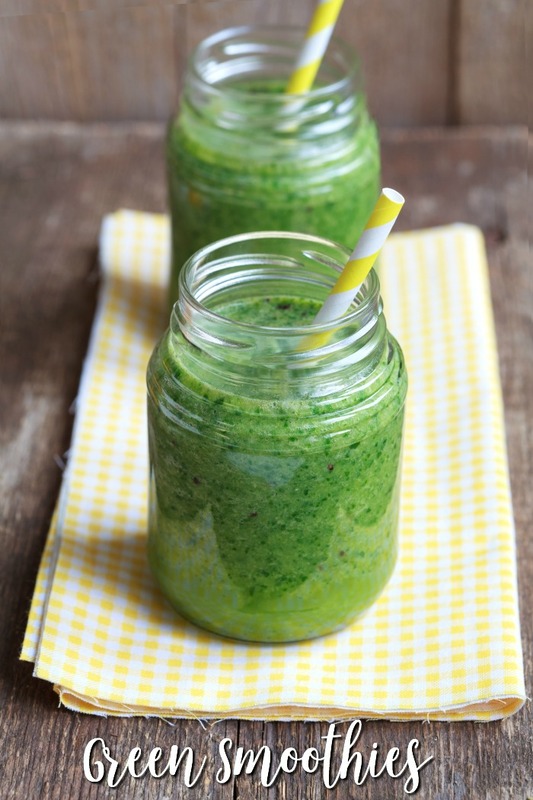 A good trick to sweeten up a green smoothie is to add some banana. It cancels out the taste of greens. You might also want to consider adding apple juice instead of water. This same trick also works well for adults who aren’t green smoothie fans. Your priority should always be to get them to drink the smoothie so they’ll get those nutritious extra greens in their diet. If that means you have to add half a cup of apple juice to make it drinkable, that’s better than succumbing to a convenience meal of cereal, frozen pizza or a plate of chicken nuggets and fries. Here’s a few more smoothie hacks to encourage them to drink up. Start with some of their favorite fruits, veggies and foods in general. Do you have any peanut butter and in the house? Try blending up bananas, berries, milk and a spoonful of peanut butter. You can save money and streamline the process by purchasing bags of frozen fruit from your local warehouse club (organic varieties are becoming more available) and the big tubs of organic greens. Add everything to your blender. Blend until smooth. Add everything to your blender and blend until smooth. This makes one serving for a meal replacement, or divide it up for a snack. The Family Café exists to provide individuals with disabilities and their families with an opportunity for collaboration, advocacy, friendship and empowerment by serving as a facilitator of communication, a space for dialogue and a source of information. The Hyatt Regency Orlando and convention center were huge. It was a great locale for our community; it was very easy to navigate and the hospitality was top-notch. And I loved our room! We usually make this a weekend getaway but didn’t have anyone to watch Nic this time around so we wound up taking him with us. It was his first conference and he was a little overwhelmed with it all. It was a lot of walking for him as well as the first time he ever rode in a high rise elevator and he didn’t handle it well, moaning and groaning every time the elevator had to make a stop. Every time I attend Family Cafe I’m reminded how many families there are like us and we’re not alone. It’s a relief to be around people who don’t stare and who understand the struggles that we go through. The need continues to be vast with 20,000 disabled people on the wait list who still desperately need support and services. I decided not to overwhelm myself with too many conference sessions. We went to two of them on Friday and the Governor’s Summit. Saturday morning Nic and I went down to the pool. My husband took him after awhile so I got a bit of time to myself on the lounge chair. In hindsight, I’m glad I took it easy on Saturday and found joy just hanging around the music and exhibit hall. Little did I know the horror that we were going to wake up to the next morning. Initially I heard 20 were killed at The Pulse, and by the time we got to the ballroom to hear Sunday morning’s keynote speaker, it was 50. I don’t think I’ll ever forget hearing that number for the first time. I’ve watched this video of the Pyramid Players performing “Stand by Me” over and over. I filmed it less than 12 hours before the shooting, and it is so poignant now. Being around the disability community always teaches me a bit more about the importance of community, loving unconditionally, and acceptance. The world has much to learn from them. One of the marvelous things about community is that it enables us to welcome and help people in a way that we couldn’t as individuals. When we pool our strength and share the work and responsibility, we can welcome many people, even those in deep distress, and perhaps help them find self-confidence and inner healing. Part of self care is learning to reach out to others. Many of us struggle with isolation. Our schedules are overloaded the daily-ness of caregiving, advocating, medical and therapy appointments leaving very little time for socializing. While nothing can replace time spent together in real life, it can be really encouraging to find a few blogs that are consistently encouraging and refreshing. Use an app like Feedly to help organize them and keep for quick reference. Before you jump on Facebook or other social media, take a few minutes to read something positive and encouraging. 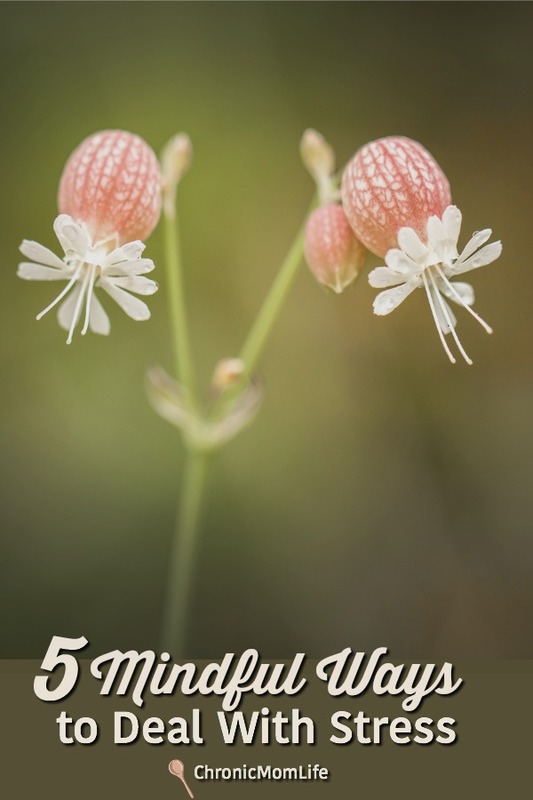 I’m going to keep things simple and just list five seven of my go-to websites for spiritual refreshment. She Reads Truth – I can’t say enough good things about this site. It has revitalized my devotional time which had become quite stale and now, I don’t miss a day. Rachel Wojo – practical Christian living helps to help you walk out your faith every day. Clare Smith – If you’re like me, practicing and maintaining a healthy lifestyle doesn’t come easy. I check in with her frequently to help me keep motivated. Sheri Dacon writes extensively about her faith, struggles, disability and the church. Ellen Stumbo is a mom of three, two with special needs. Her heart is to encourage churches to embrace disability. Gillian Marchenko is a mom of two girls with Down Syndrome. She also writes eloquently about depression. Special Needs Parenting is a blog whose mission is to remind special needs parents that they’re not alone. 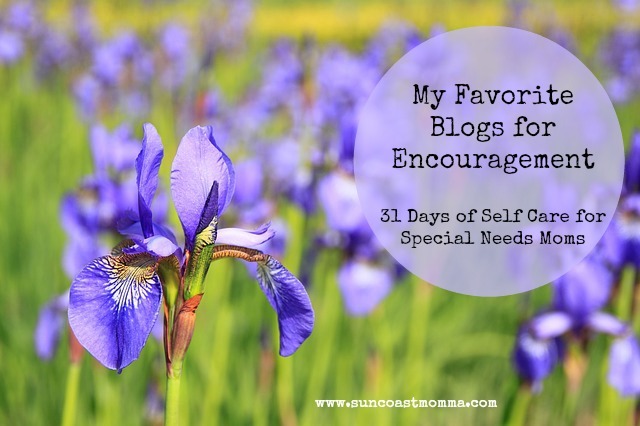 Do you have any favorite sites to help you stay encouraged along the way? 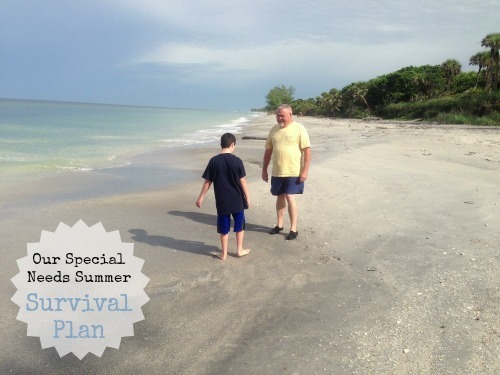 Summer is a challenging time for special needs families. Here in Florida, schools let out on Tuesday for that long, long break until the third week of August. The month of May, chaotic on any given year was even more so with two of my kids graduating college and high school. Plus multiple end of the school year festivities. Plus three root canals (I was too far gone for the holistic stuff.) And in the middle of all this a brand new diagnosis to come to terms with and read about. This time of year always gets stressful but somehow I manage to block it out until it’s that first week where Nic is home from school and all hell is breaking loose. Why the stress? * He loves school, his friends, and the cool field trips. He’s now home with his dystonian mother with the shaky head who can’t drive him to the beach. * He needs structure. I’m a free spirit who is incapable of sticking to a routine for more than a day. *It’s freaking hot down here. He barely sweats and has to be watched closely outside so he doesn’t overheat. *Florida summers also mean wild lightning storms, keeping an eye on the hurricane/ tropical storm forecast, lurking pygmy rattlers, water moccasins, mosquitos and fire ants. And singing frogs. So what do we have going on this summer? Well, he just had his OT evaluation today and was pronounced to be really in need of services. That’s no surprise after years of 30-60 minutes a week of OT in the public school system for years. His sister needs OT too but we have to wait for some paperwork to go through. Thankfully, they are holding the spot for her. His new bike – It came last week and he’s thrilled to be riding it. He does have low tone to contend with but I think his will and determination will overcome that. 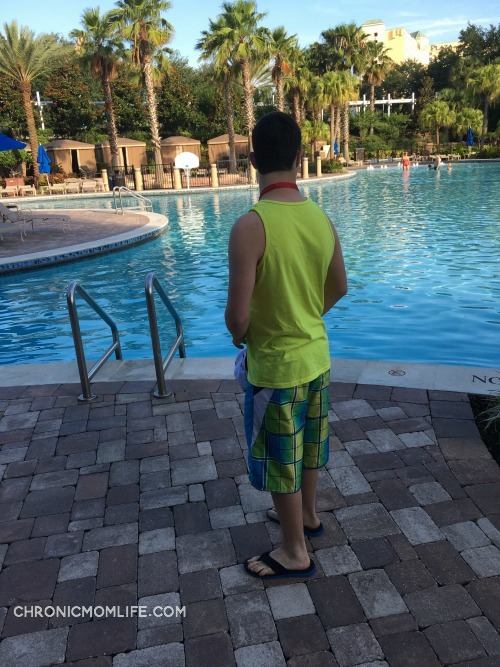 Four weeks of camp – We’re fortunate in Florida to have several special needs camps that he can participate in as well as a couple of church based respite programs. Respite – I’m lucky enough to have respite in a state where the average wait time for services is 10 years. It took my dystonia diagnosis to get it and there are many days I’d give the hours back not to have dystonia anymore but that is the hand I have been dealt. God has provided for me in this way and I’m grateful. Swimming happens at the YMCA. And a beach trip. Lord, I can’t wait. What are your summer survival tips? This morning I had the dubious pleasure of watching the appearance of Gavin McInnes on The Sean Hannity show when it appeared on my Facebook stream courtesy of the National Down Syndrome Congress. As a mom of a soon to be 13 year old young man with Down Syndrome I was saddened and sickened by the comments made by Gavin McInnes calling Al Sharpton a retard. He then went on to compare Al Sharpton to someone with Down Syndrome. I was equally disturbed by your non-response. You said, “Why are you asking me? Am I the thought police?” Before the clip cuts out you were smiling. There are a lot of words that could be used to describe Al Sharpton but retarded (or Down Syndrome) isn’t one of them. Mr. Hannity…this isn’t about being politically correct. Did you miss the memo that “retard” is hate speech? That it’s disrespectful to people with intellectual disabilities? The R-Word is just as offensive just as any other minority slur is. It’s not funny. It’s not okay. It’s unacceptable. By allowing a guest on your show to make a mockery of the Down Syndrome community you are sending a message to your huge audience that this bigotry is okay. Ann Coulter, a frequent guest on your show has thrown around these slurs as well. As conservatives and Christians shouldn’t we be known for our compassion and empathy? Perhaps you might want to consider taking the pledge yourself. Use your platform to spread the word to end the word. The first time I heard about Bill Irwin was during a church service sometime in 1990. The pastor announced that there was a blind man hiking the Appalachian Trail all the way from Georgia to Maine and he asked the congregation to pray for him. I couldn’t foresee that we would actually get to meet him, become friends with him in the not-too-distant future or know the deep impact that he would have on my life as disability came sooner than I could ever imagine. 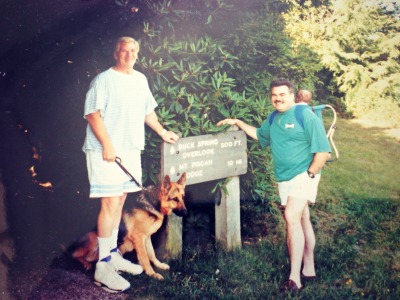 In 1991, my husband decided to start a Came to Believe retreat in Queens, New York. These retreats freely spoke of the influence that the Bible, Oxford group and devotional ideas that helped early AAs to get and stay sober. We thought Bill would be a wonderful speaker for our event and were very excited when he accepted our invitation. One of the wonderful gifts of The Fellowship is that in spite of the heartache of our drinking and drugging histories, and the price we paid to get to AA, we can find laughter and camaraderie with other alcoholics and addicts. Bill had us hysterically laughing as he shared some of his adventures with us. But most importantly, he showed us the transforming power of Jesus Christ that turned his life around and became a powerful witness to the many who have heard him speak or read his book Blind Courage. 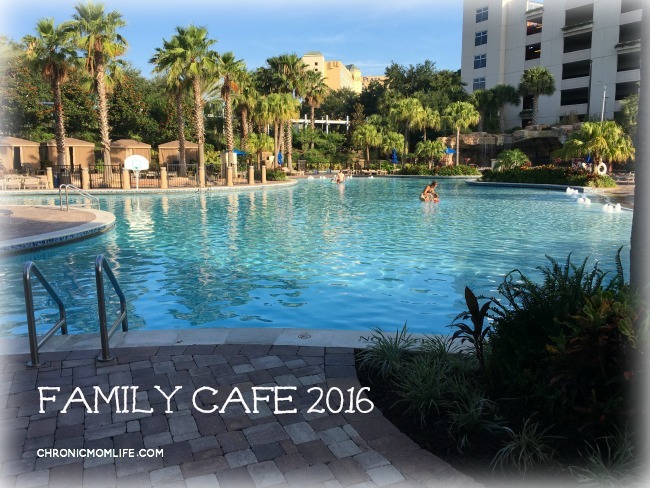 We moved to the Tampa Bay area of Florida in 1994 and I had three more kids. Motherhood has not been an easy journey for me. Among four kids we have diagnoses of scoliosis, NF-1, Down Syndrome, a congenital heart defect and learning disabilities. I was overwhelmed just about all of the time. I was at a Down Syndrome conference around 2009 and remember very clearly the speaker saying that disability would happen to all of us eventually if we lived long enough. Like anybody else, I figured that was way off in the future. It wasn’t. 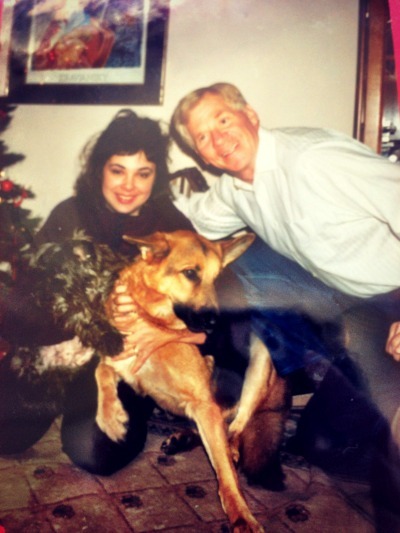 In the summer of 2010 I began to experience distressing neurological symptoms causing my neck and shoulders to twist involuntarily, as well as a head tremor. I was quickly diagnosed with cervical dystonia, a neurological movement disorder. 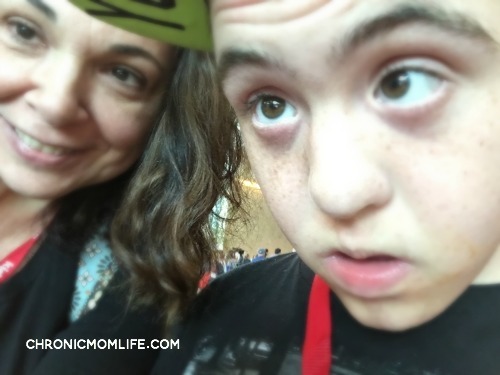 It is a devastating diagnosis, and doubly so as I was already a special needs mom. 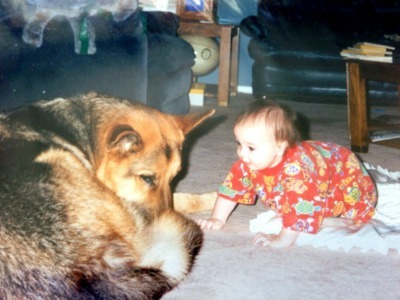 I couldn’t drive and could barely get off the couch to take care of my family. Six months after my symptoms started, my son had a cardiac emergency and had to get a pacemaker. Although I’ve been sober since 1986, depression and anxiety are still a real problem for me. They got worse with the intensity of my symptoms. I researched cervical dystonia online and was distressed to learn of some suicide attempts and drinking. I knew I was in a dangerous place but I could not get myself to a meeting. I made a decision I was going to hang in there for my family and chased recovery as hard as I had chased drinking and drugs. I found people online who were living with dystonia positively. The one thing I found they all had in common was exercise was a big priority for them. Initially I couldn’t walk more than a couple of hundred yards on my street. But with physical therapy stretches and yoga, I slowly started to improve. And then I remembered Bill and his walk. I started to think that God had sent Bill into our lives as His advance man to show me how to live with disability and recovery. 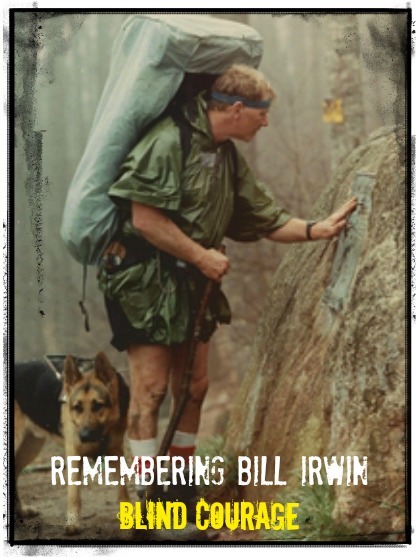 It was hard for me to stay in touch with Bill as our lives had become so hectic, but I often thought about the walk. The part I remember most clearly was when he was crossing the treacherous river. How often I’ve felt like that in my own life. I was saddened to learn that Bill went Home last week. Saturday I went to bed teary eyed thinking about Bill. 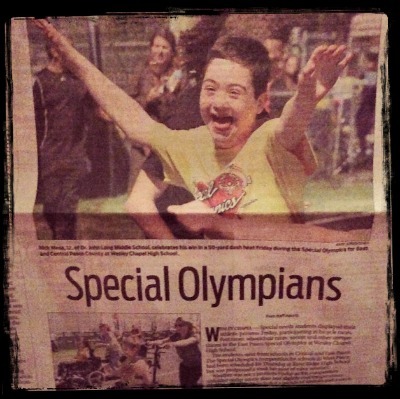 Sunday morning I woke up to find out that my son Nicolas had made the cover of the local section of two area newspapers. This is Bill’s legacy in our family. Overcoming and perseverance. 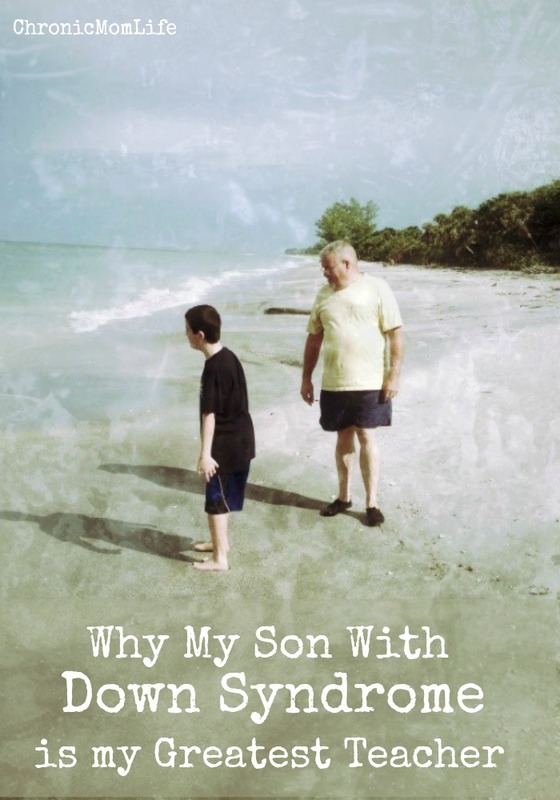 I will surely share Bill’s story with Nicolas as he has the ability to understand that nothing has to stop him from living a purposeful life. Unless God chooses to heal me, dystonia will be a thorn in my flesh the rest of my life. Despite my exercise and shots, some days are miserable. I can get depressed and feel sorry for myself about not being the same mom to my younger kids that I was to the oldest. But God did not leave me comfortless. He sent friends such as Bill Irwin into my path to show me how to live with disability and limitations. I was hoping to be able to see Bill again and sadly I won’t this side of heaven. But I know that he’s with God now and he can truly see. I was blessed to meet his wife Debra and I just know that God has great things in store for her to continue the ministry that she and Bill had and their message will continue to go forth. Bill’s inspiring story of perseverance is being made into a movie. Follow Blind Courage the Movie on Facebook for updates. You can find also find the book Blind Courage on Amazon.